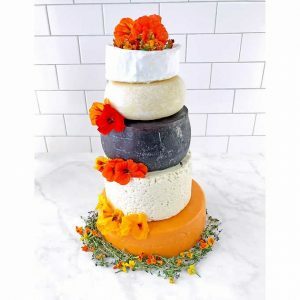 If you can’t get enough of cheese, well, you can now have it in lieu of (or in addition to) a traditional wedding cake. Costco is selling a 5-tier wedding cake made completely out of cheese. So, while you are looking for shampoo, you can snag a wedding cake, too. The 5 level ‘cake’ is made up of wheels of cheese I’ve literally never heard of, but they sound fancy. The cheeses include Red Leicester, Danish Blue, and Murcia al Vino from cheese purveyors Sid Wainer & Son. The ‘Sid Wainer & Son Cheese Lover Artisan Wedding Cake’ weighs 24 pounds, serves up to 150 people and will cost you $440.